In my last post, I spoke of being ‘thumped’ and asked the questions: What has God called you to do that requires more of you? What are you facing that requires the very best that you have? As followers of Christ we are called put on the Armor of God and stand against the powers of darkness. I have written about this to some extent in previous posts, and will come back to it again another time. But not every challenge encountered is a demonic attack. Sometimes, we are tried (tested) simply by encountering other peoples stuff or other natural circumstances of a fallen world. I believe this is the enemy’s A#1 go-to plan to come against those who bear the Name of Christ. To put circumstances around us that test our character and test our beliefs – hoping we will take offense at the test and walk away from the very One who has given us the victory (through Him) in all things. And sometimes, what we are experiencing is the consequence (delayed or immediate) of our own choices, words, and actions. It is easy to point to outside circumstances for our pain and suffering, but it requires humility before God and a teachable spirit to allow Him to poke at and point at the areas in our life that need to be addressed for our greater good. In the same way that a loving parent will teach independence to an infant by allowing them to stand and fall over and over again until they develop – through testing – the balance, coordination and strength required to walk and eventually run on their own, our loving God allows us to undergo periods of testing in order to help us identify and confront the beliefs, circumstances, and behaviors that are holding us back from His best for us and poorly represent His character and His name. Lord, give us wisdom to recognize an attack from a trial, and show us through your Word the proper response for the challenges we may encounter in our lives. When under attack, may we be quick to respond with boldness under the authority You bestowed upon us as Your ambassadors on this earth. And when I’m ‘thumped’ by trials, may I recognize them as opportunities to be developed, strengthened, and even pruned/corrected. As opportunities to be ‘proven’ as authentic and of quality, reliable and durable. Who will I be when I’m winning? Who will I be when I’m loosing? Who will I be when stuck between a rock and another rock? Will I choose to act in a way that is unbecoming to someone who bears the name of ‘Christ follower’? WilI I choose to stand boldly and confidently on the Word of God, fully relying on Him to bring this to a conclusion that is both for my good and His glory? So what about all those challenges I have been journaling about for months and in some cases even years? Well, I would like to end this post by declaring who I am and what I have! Yup, that’s me – speaking of things that ‘be not’ … as though they are, until they are! As I shared in Receiving Instruction (part 1), I had been looking back through some of my older journals and was feeling a bit discouraged. But as my morning devotions ended, I began to notice that throughout all those seasons of challenge God was at work in me. He brought correction to my heart about prideful attitudes. He gave light to ‘stinking thinking’ that needed to be brought into alignment with His word. He taught me about the power of my words to either bring blessing or cursing into my life and the lives of those around me. He renewed my mind and mouth through the power of His Word and Spirit at work within me. And He also gave fresh vision to the dreams I wrote about years ago. Back then, I was at the very beginnings of this journey I’m on to step into His calling for my life. A little slip here, a little stumble there, but it certainly was fun to read my notes from along the journey, and thrilling to be able to point to a place in time as the very ‘birthing place’ of dreams I’m acting upon in 2014. With that revelation, and believing God has called me to rise up and step forward as a woman of influence, I concluded that these seasons of trial, while not issued by God, can be used for a higher purpose to “test” or “prove out” my character as a leader. And I began to ask different questions about some of the challenges I’m facing today – now viewing them from a higher perspective. Who will I be when I feel mistreated or falsely accused? Who will I be when I don’t get what I think I deserve? Who will I be when prayers seem unanswered? The truth is, I don’t much like being pressed and tested! And it usually doesn’t bring out my most alluring personality traits. But I was reminded that if I want God to open doors of influence for me, I shouldn’t be surprised to find that more is expected of me (reference James 3:1), for He is not going to give me greater influence if I am not presently a good steward of, or influence upon, the hearts and souls that are currently within my circle of influence. TEST: a procedure intended to establish the quality, performance, or reliability of something, esp. before it is taken into widespread use. PROOF: able to withstand something damaging; resistant. 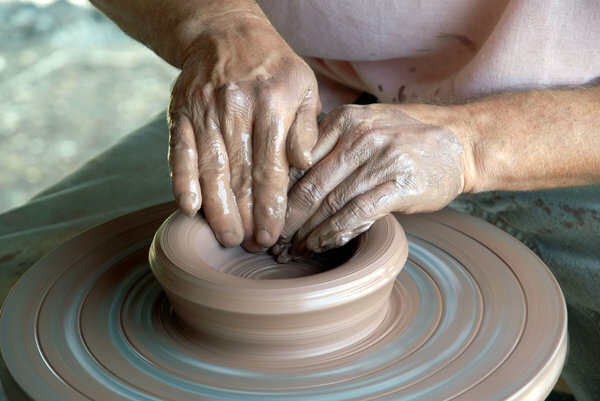 I like the way Max Lucado compares testing to the thumping process a potter uses when testing (or proofing) his pottery. If it ‘sings’ when it is thumped, it’s ready. I need to sing more, and thud less! What has God called you to do that requires more of you? What are you facing that requires the very best that you have? I’ll take a break here, allowing you time to ponder that question as it relates to your own life and circumstances. And I do hope you will take the time to post a comment or share your thoughts below. We don’t live in a vacuum and I don’t have all the answers. It happens to us all. You feel a prompting in your gut about something, or a light bulb suddenly goes off in your head. Sometimes you may have a full understanding of it, and immediately know what your response should be to that revelation. But other times it may be more akin to catching a glimpse of something out of the corner of your eye, or hearing a snippet of an instruction – perhaps even just a single word or small phrase. You may ask yourself, ‘Did I really see/hear that? What does it mean?’ Then just a few days later, you turn on the TV and come across a program discussing just that subject. I’m describing those times when it seems like everywhere you turn, the same word/message seems to be coming at you – from TV, to radio, to friends even strangers. Well, I’ve been having that kind of experience lately. There are certain words/phrases and snippets of knowledge that have been peeking out at me from books, podcasts, and around the corners of my mind/understanding. I’m hungry for them to unify into an cohesive understanding, and so as free time allows I have been setting aside quiet time to dig deeper, seeking His heart and His word for discernment and revelation. This morning is one of those times. 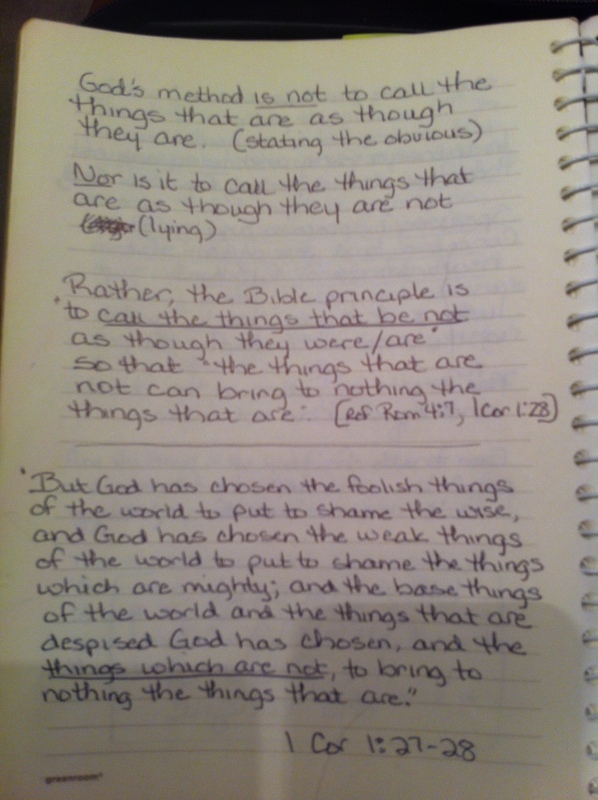 In the course of my quiet time this morning, while talking with the Lord about certain challenges I’m facing, I paused to look back through some of my older my journals. And in doing so, I was a bit surprised to see that I was writing back then about some of the same things I journal about now. In some ways, that was a bit discouraging – because I would rather have read about former challenges that I now (in this present moment) have victory over. For example, in 2010 I was responding to a prompt to ‘step up’ as a woman of influence/leadership, and had crafted a “Statement of Purpose” for my life inspired by John Maxwell’s book “Developing The Leader Within You“. Oh, to read the enthusiasm and faith displayed in those 2010-2011 entries. God was leading me, teaching me, I was being challenged and also changed. I was letting go of (at least in part) the insecurities that had kept me ‘living small’ and was daring to dream of things impossible for me to achieve based on my own qualifications. Then life happened, and it rather grieves my heart to say that some of the same fears and insecurities that I was writing about conquering back then are still stalking me now. Oh, yes, I’m now much quicker at dismissing them as falsehoods (issued direct from the pit of hell) but in truth – I have not entirely “broken up with fear” as I so boldly declared in my journal back in 2010. Fear was alive and well in my life throughout 2012 and a good chunk of 2013. Which is why I (again) declared a Break Up with Fear in 2014! Or what about all those entries pouring out my heart during seasons when I felt persecuted by unfair circumstances, or under attack in some area of my faith-walk. In some cases, it was exciting to later read an entry about a fresh revelation or victory seen – but there were also plenty of entries that sounded a lot like my writings in recent months. I’m going to pause here because otherwise this would be a very lengthy post. Please check back in a few days for part 2, and while you’re waiting please take a moment to leave a comment or two. Have you ever heard the same message coming to you through TV, radio, etc? Or have you ever looked back to old journals, diaries, or photos/videos and what were your experiences? See you again in a few days!